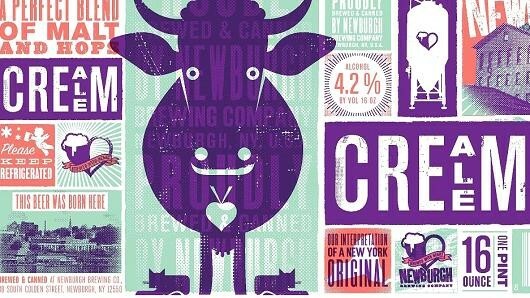 The Newburgh Brewing Company's Cream Ale beer label has officially won CNBC's 2015 Most Loved Label competition, beating out 63 other labels nationwide to come out on top. The purple moon-eyed cow, Betsy, is bordered by testaments to the city that bore her. "This Beer Was Born Here" overlays shot of the Newburgh Waterfront. A white outline of New York stands out on a melon background, the words "Our Interpretation of a New York Original" stamped in Betsy-purple. The iconic Newburgh Brewing Company logo promises, "Made With Heart. MSNBC started the contest last year "to celebrate the creativity being displayed on the outside of the bottle." Taste aside, this is an art competition. For that, Newburgh Brewing Company can thank Matt Bouloutian, the owner of Modern Good, a design studio specializing in identity development. Newburgh Brewing Company calls Bouloutian's graphic design work for them "second-to-none." With this award under his belt, they can definitely say that again. To celebrate the big win, Newburgh Brewing Company is running Cream Ale specials all week long. From Wednesday through Sunday of this week, they're offering $3 pints and $7 4-can packs of the winning brew.